Peru, officially the Republic of Peru, is a country in western South America. It is bordered on the north by Ecuador and Colombia, on the east by Brazil, on the south-east by Bolivia, on the south by Chile, and on the west by the Pacific Ocean. 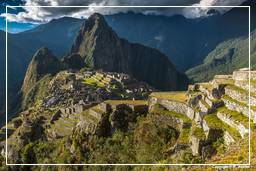 Peruvian territory was home to ancient cultures spanning from the Norte Chico civilization, one of the oldest in the world, to the Inca Empire, the largest state in Pre-Columbian America. The Spanish Empire conquered the region in the 16th century and established a Viceroyalty, which included most of its South American colonies. After achieving independence in 1821, Peru has undergone periods of political unrest and fiscal crisis as well as periods of stability and economic upswing. The Peruvian population, estimated at 29.5 million, is multi-ethnic, including Amerindians, Europeans, Africans, and Asians. The main spoken language is Spanish, although a significant number of Peruvians speak Quechua or other native languages. This mixture of cultural traditions has resulted in a wide diversity of expressions in fields such as art, cuisine, literature, and music.